Where is the best place to get a sighting of Basking Sharks? On the Isle of Man of course! The southern and southwestern coast of the Isle of Man is probably the best place in the world to watch basking sharks close inshore but you do need a few little hints. There are people who live on the Isle of Man who have never seen a shark! The Isle of Man is a basking shark hotspot AND the sharks tend to be close to shore. Of all our sightings reports during 2005-2008 a whopping 64% were within 1km of shore! The MCS Basking Shark Watch Project found that basking shark sightings were very high on the Isle of Man, compared to the rest of British waters, especially considering the relatively small length of the coastline. They also found that shoal sizes were larger on the Island than elsewhere. Manx Basking Shark Watch has been collecting your public sightings reports of basking sharks every year since 2005. 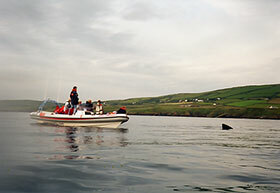 We consistently find basking sharks sightings to be located on the south and southwest coast of the isle of Man. 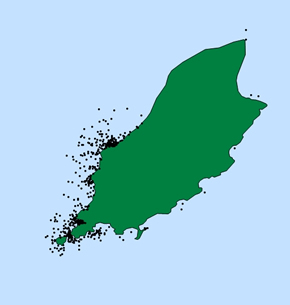 The map of the Isle of Man shows that although basking shark sightings occur Island-wide they are more common on the Southwest and West coast starting from from Castletown and working clockwise around the Island, off the Chasms and Spanish Head, around the Calf of Man, Bradda Head, Port Erin, Fleshwick Bay and northwards up the west coast towards Peel. The coast from Niarbyl Bay past Dalby, Glen Maye, behind Peel Hill and off Peel Castle, Peel breakwater and Peel headlands can be excellent areas to see basking sharks when they are here in any numbers. These places are areas of high plankton concentration so basking sharks congregate there. High plankton concentrations occur where ocean fronts are close inshore off headlands and islands, and in bays where tidal slacks occur. Local scuba divers say that one of the best times to see basking sharks is on the flood tide at Niarbyl where the tidal flow streaming from the south meets the calm water of Niarbyl Bay. 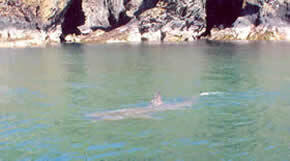 It is possible to see basking sharks from most of these sites whether you are on the cliffs or in a boat. The Marine Conservation Society Basking Shark Watch Project has shown that shoal sizes were largest in the Northwest. This is not evident from the map. The biggest shoal was 100 sharks off Jurby head in July 1991. A close encounter from a boat off Niarbyl, the Isle of Man. Please observe the Basking Shark Code, the engine must be in neutral or preferably switched off. The engine might disturb the sharks and there is a danger that the shark might get hurt by the propeller!